Château de Launay is an engaging and warm familial home. It comfortably sleeps 16 people in the château and 2 in the guest house. The flow through the chateau is very easy and the places to relax and play are many. The living room is bright and spacious, comfortably and tastefully furnished. In colder seasons, the large marble fireplace is very enjoyable. Views of the pond, moat and terrace surround the room and the adjoining tower room through large high windows and French doors. The tower in the Grand Salon is home to a chess table. One of the quiet places on the first floor is the serene library with an adjacent office in the tower. Books, old and new, in French and in English entice the reader to relax while enjoying views of the .pond and countryside. Internet access is available in the office and throughout the chateau. The formal dining room is adjacent to the kitchen and comfortably seats 6 to 18 guests. French doors open onto the courtyard and its fountain. Between the kitchen and the terrace wing is an informal dining-breakfast room with a stone fireplace that is ideal as a central meeting point, with a beautiful view of the swimming pool. The terrace wing overlooks the moat and has its own bedroom with bath on the second floor. The playroom on the first floor with two pairs of French doors opening on the terrace is where TV and DVD viewing or workout equipment can be enjoyed. All the bedrooms are very clean, comfortable and well appointed with splendid views of the property. The second and third floors have a total of 7 bedrooms including the terrace wing, each with its own en-suite bathroom. 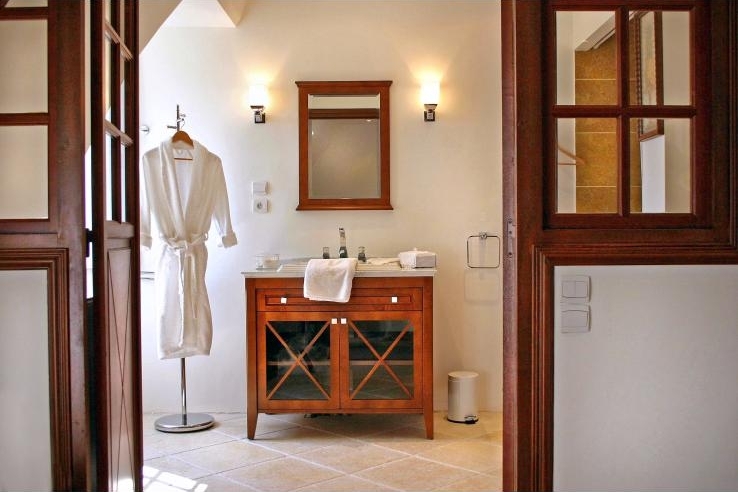 All the en-suite bathrooms have been remodeled or renovated in recent years to satisfy modern demand for comfort featuring elegant fixtures and natural materials. Three of the bathrooms are located in the towers taking advantage of this unique architecture. The second floor includes one twin bedroom with two twin-size beds and three double bedrooms (one of them also has two twin-size beds). The third floor hosts two double bedrooms. The Terrace wing double bedroom is located on the second floor. An open room preceding the entrance of the bedroom offers additional accommodations with a full-size bed, a twin-size bed and a comfortable folding new sofa making it the ideal suite for the family with younger children. A crib can be installed in this open room as well as in any other bedroom of the chateau. The guest house (previously a guardian house) which may be prepared additionally upon request hosts a double bedroom and simple bathroom. These quarters are a bit rustic and isolated but may suit a younger couple. The chateau and guest house offer a total of 8 bedrooms and can accommodate 16 to 18 guests. A true fairy tale paradise! "Heaven! We all thought we were in absolute heaven! Gorgeous chateau with ultimate privacy but near enough to charming villages and towns. So very spacious but at the same time immediately felt like a home away from home with every amenity you could ever need, a wonderful functioning kitchen with ample space. We had a fabulous housekeeper to assist us in the upkeep everyday. She took such good care of us with delicious petite déjeuner every morning. After the first day we were all planning when we could return. I'd recommend waking before dawn to see the sun rise over this fabulous property as the birds chirping and the black swan and ducks prepare for the day. It was like waking in a Disney film every morning. Absolutely rent a car since it is close enough to many famous Chateau if you can pull yourself away for a day trip, and many restaurants, shops. We booked Nadine and Jacques to cook us an incredible French country meal for one day and would book them for more than that when we return. Delicious! The whole experience I would say felt once in a lifetime, well perhaps for others. I believe we will make this our regular Chateau to vacation in. Just perfect!"